ONLINE – A draft human rights policy from the College of Physicians and Surgeons of Ontario (CPSO) released in late 2014 has critics concerned the policy will restrict the religious and moral freedoms of physicians in Ontario. Historically, the CPSO has recognized the right of doctors to refuse to provide non-emergency treatment to patients when such treatment conflicts with the physicians’ moral or religious beliefs. The new policy would force doctors to refer patients to other physicians willing to provide such treatment. 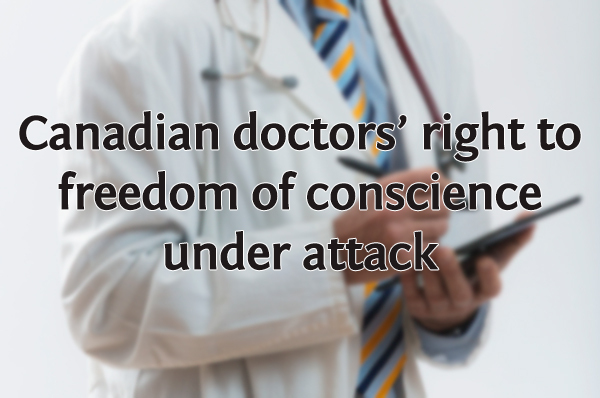 “[The] draft policy has deeply disturbed health service providers and patients,” writes Executive Director Larry Worthern of the Christian Medical and Dental Society of Canada (CMDS), along with Albertos Polizogopoulos, a constitutional law expert with Vincent Dagenais Gibson LLP/s.r.l. The CMDS represents 1600 physicians across Canada. The change is considered particularly distressing in light of current debate in Canada over the legalization of euthanasia. The new policy could conceivably force doctors to refer patients attempting to procure an assisted suicide, despite the physicians’ own belief that the taking of life is morally wrong. The CPSCO is accepting comments on the draft policy until February 20, 2015. Under many forms of government tyranny throughout history, Christians have experienced the boot of oppression when compelled by unjust laws to set aside their convictions and their faith to please the wicked in authority. It is certain that such rules as this one coming from Canada will test the resolve of those who practice their faith, and it will separate the faithful from the pretenders.